Lots of space for sailors and also for sleeping (up to 6 with deck tent). Magayon could only sleep 2 adults. For day sailing it can even accomodate a lot more people because of the much larger cockpit and deck area. The Tiki 26 can still be trailered. We never used the (larger) cabin of our 23ft Sharpie because here in the tropics it got too hot inside. 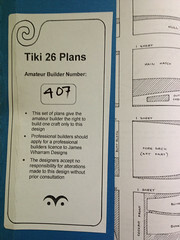 Almost every component of the Tiki can be self made. Additional reasons can be found on the Wharram homepage. 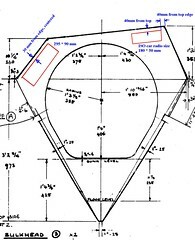 So we finally ordered the plans hoping that we would sail within a two years timeframe. With a new contract for 5 years there is time for another boat building project. After a trip to Manila to source good quality marine plywooed, Martin found out that Makiling Hardware in Los Banos does have a stock of Santa Clara Plywood. It is manufactured in Cebu and also exported. Supposedly it is the best marine plywood that can be found in the Philippines. Since we don't have a building location yet for the hulls we bought only a few sheets to start working on the bulkheads and the cross beams. Miriam, after helping to transfer the drawings of the bulkheads onto the first board: "What? 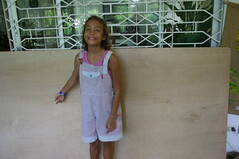 So small? We are supposed to sleep in there? We'll get claustrophobic." We cut out four bulkheads, and then shelved this for some time because working on the cross beams seemed to promise earlier success experiences, something needed at this stage. 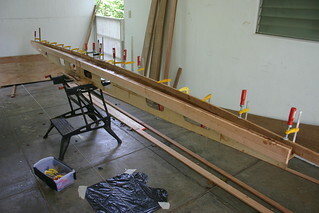 May 2009: The center cross beam under construction. This carries the mastfoot and therefore is the most complex of the three cross beams. 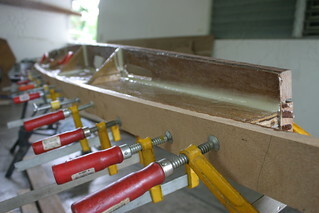 It consists of of may different plywood parts and wooden beams, a good practicing piece for getting familiar with the different epoxy techniques, glueing, epoxy fillets, and glassing. Almost finished before our 2009 home leave in July 09. March 2011: The boatbuilding project was on a hold for almost two years because restoring the BMW took all of Martin's spare time. 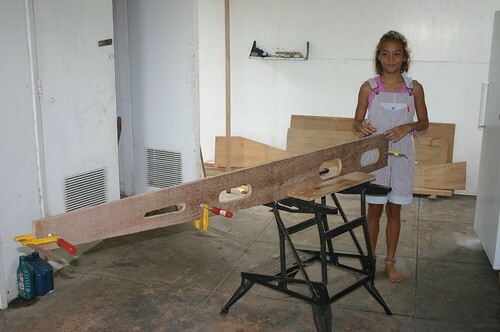 In January 2011 we took it up again by starting to build the aft cross beam. In the meantime we looked for a building location for the hulls because the noise would have given our neighbours a hard time and we might have been thrown out of the housing complex where we live. 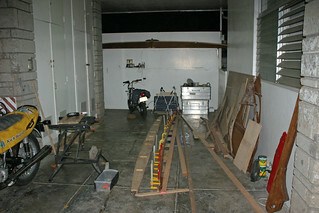 Finding a site in Los Banos was not an easy task because every space is used somehow. Options assessed included a house ruine a friend wanted to by for rennovation, an open space at a Barangay Captain's property at the lake down in town, renting a space at the institute and others. It was fruitless.